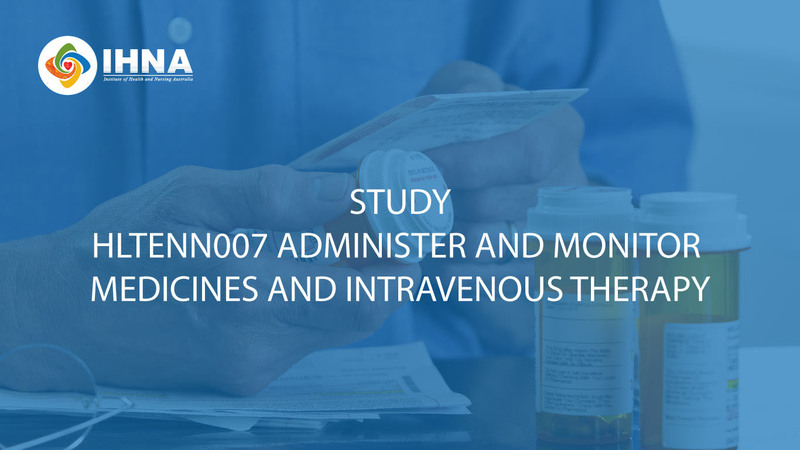 The HLTENN007 - Administer and monitor medicines and intravenous therapy unit provides the skills and knowledge required to diligently administer and monitor medications and intravenous (IV) therapy. Students will learn how to work out precise dosage calculations based on patient requirements, and correctly interpret written instructions from an authorized prescriber. They will be able to perform an assessment of the patient for medication effectiveness and side effects, and can effectively respond to an allergic pharmacological reaction. This course will be delivered and assessed over 250 hours. The course will be offered in blended learning approach. They must produce evidence of vaccination supplied prior to clinical placement. While IHNA will work with you to make "reasonable accommodations" in the campus lab and classroom, there are clinical practice conditions that occur in the workplace environment that are beyond IHNA control. The physical requirements below are necessary to function in the hospital and community health settings. Students must be able to perform and complete course objectives and requirements with or without reasonable accommodations. Additional skills and abilities are needed to perform patient/ resident care in the clinical settings to pass the course objectives and requirements. Vision: Sufficient to make physical assessments of patients and equipment. If you have a disability that will require reasonable accommodations to fulfill these requirements then please declare in your course application, special needs section. Students will be assessed in both formative and summative methodology. The assessment tools are mapped to the current version of the unit of competency elements, performance criteria, knowledge evidence, performance evidence and assessment conditions. Blended Mode Theory is delivered online and its SBA's will be carried out at the above facility or any other facilities approved by IHNA. Students enrolled for the blended mode of delivery can attend the simulation workshops at an agreed campus. The application process involves 5 steps: application, interview (plus Language, Literacy and Numeracy), offer letter, payment and confirmation of enrolment. Applicants must successfully complete each stage in order to enrol. Applicants can submit their initial application online. Applications can be completed online by clicking 'Apply Online' button. If you have any other questions, feel free to contact us on 1800 22 52 83 (TOLL FREE).